“StayLinked’s commitment to innovation is unparalleled and we’re thrilled to offer the StayLinked solution to our customers,” says Emkat CEO, Brad Kieley. 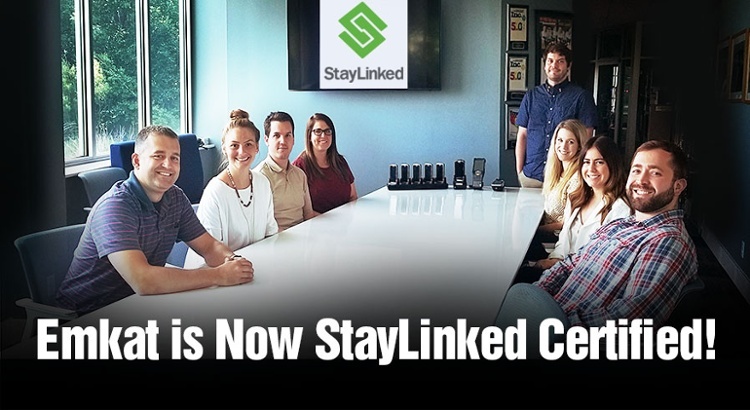 Emkat, a leading mobile solution provider based in Plymouth, Minnesota, is now StayLinked Certified. Concentrating primarily on mobile hardware sales and service, Emkat is a valued StayLinked reseller that offers customers of all industries with creative, cost effective deployment solutions for RFID, barcoding, asset tracking, and other industry efficiency increasing projects. With StayLinked Certification, Emkat has further strengthened their ability to provide migration and modernization services for enterprise warehouse environments. Emkat solutions include; proof of delivery, field service, route sales, direct store delivery, inventory, asset tracking, and warehouse automation. These solutions help eliminate duplicate data entry, provides a seamless interaction between the worker and the business processes, and produces a more efficient and profitable employee. To achieve StayLinked Certification, Emkat engineers completed rigorous testing to reinforce their effectiveness in providing exceptional service to their customers. With StayLinked Certification, Emkat has ensured that their engineers and service teams are up to date on the latest StayLinked product features and capabilities giving them added expertise to maximize their customers’ investments. John Haller, StayLinked's Director of Technical Training and Support, also commented on the success of the certification process, including valuable insights the Emkat team provided. “The Emkat team had innovative ideas on how several of our features might be used to help their existing customers,” says Haller. The training consisted of several days of intense focus on StayLinked's existing functionality as well as of the exciting new features emerging from StayLinked Labs. “They were especially interested in the flexibility of our printing and automation features. They have customers today that can use these approaches to solve requests for indicator lights and conveyor systems that react to erroneous inputs.” Haller said. Using a customer-first approach, that combines flexibility with exceptional customer service, Emkat provides customized mobile computing and barcoding solutions to ensure every business can operate at their maximum potential. With the introduction of host-based, thin client emulation in 2002, StayLinked Terminal Emulation changed the landscape of wireless host-based application delivery and stability. The company continues to drive innovation with true software-only emulation session persistence; centralized session configuration, and management of wireless emulation sessions (Telnet/SSH); terminal emulation application modernization (SmartTE), and the only Business Intelligence product designed for terminal emulation environments (StayLinked iQ). StayLinked software is available for all popular mobile devices from those running traditional operating systems such as DOS, CE, and Windows Mobile to the latest versions of Android, iOS and Windows 10. For more information, visit http://www.staylinked.com, email info(at)StayLinked(dot)com, or call +1-714-918-7700.